Home Blog Who Is Santa Claus, Is He Real? Who Is Santa Claus, Is He Real? Hi! Most children in the West are brought up being told that a jolly fat magic man delivers their presents every year. But as we grow older and wiser we start to think that maybe isn’t the whole truth and the disappearing mince pie and brandy has a lot more to do with your actual father than Father Christmas. But naysayers I’m here to present a different point of view and go with me on this one. What if Santa Claus, is real? Well, he could be. And I’m not talking about magic but actual science. What happens when we apply maths, formulas and the laws of motion to a large man with brandy addiction? But surely it’s impossible for one man to deliver millions of presents to millions of homes in just one night? Not to mention the flying reindeer and sweat-shop elves. Well depending on how naughty you’ve been this year, you might be pleasantly surprised…let’s take a look at the actual physics behind Santa Claus and find out if we shouldn’t be so quick to disbelieve in a very old Christmas legend. So one of the major issues people have with the big K. Kringle is that he couldn’t possibly visit every house on Earth in one night. But the thing is he doesn’t have to. To start, he reportedly only visits children, of which there are 2 billion of on Earth, that’s people under the age of 18. The average children per household across the world is roughly 3.5.So that leaves 1 billion households for Santa to visit on Christmas Eve. It’s commonly been accepted throughout history that Santa doesn’t visit children of non-Christian religions such as Muslim, Jewish, Hindu, and Buddhist. So if we factor out those households that leave us with only 92 million homes for Santa to visit, that’s significantly less. Also, Santa doesn’t have to fit all these into just 24 hours on Christmas Eve. If he travels from East to West he would have 31 hours in which to deliver presents, thanks to time zone differences. This leaves Santa with roughly 1/1000th of a second to get down the chimney, deliver presents and consume whatever treats have been left out for him. He would have to make 822 visits per second. A challenge indeed. And that brings us to the ever so complicated topic of flying reindeer. There are an estimated 300,000 species of living organisms yet to be classified, and there exists a bleeding snake that can fly, so who are we to say there aren’t flying reindeer somewhere out there. But one of the biggest obstacles stopping Santa from being real is not magical deer but the payload he would have to carry. 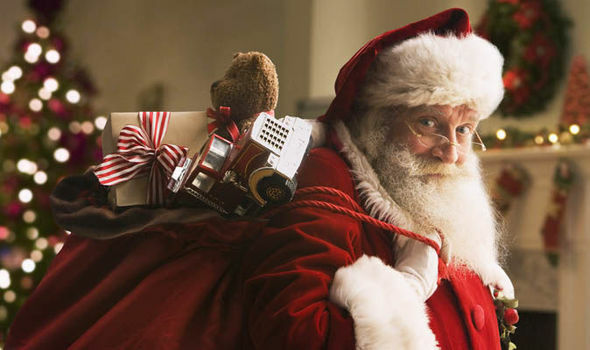 Even if every child only received a small toy from Santa, around 800g on average, it would result in a payload on Santa’s Sleigh weighting 302 million kilograms. And that’s not even counting all the coal for all the horrible little terrors. Now consider that Santa would have to travel at 650 miles per second to get around all the required households in time for Christmas morning.302 million kilograms traveling at that speed would exert a red-nose shattering 13.5 Quintilian joules of energy on each reindeer, due to the immense air pressure created at such speeds. At those pressures, Blitzer’s going to get blitzed and Comet will turn into an actual comet. Scientists have observed large clusters of particles that seem to behave as one single particle, admittedly these clusters of particles are nowhere near as large as our prospective Mr. Claus, but have some imagination for goodness sake. So if Santa and his reindeer are a cluster of billions and billions of particles, acting together as one – he could theoretically still adhere to the laws of quantum mechanics and deliver lovely gifts to deserving children all over the world, in just one night. This would also explain why his super-secret Bond-villain, death starbase of toy-construction is tucked away in the North Pole. Because quantum particles only behave in this manner is very, very cold environments. Scientists have only observed the behavior at close to absolute zero; minus 273 degree Celsius, which is somewhat colder than the North Pole. But then, we have to allow for some magic at Christmas, don’t we?